Click on any inset map for a full DOT map of Richland County. Click here for a DNR Trout Stream Map of Richland County. The Stretch: Bear Creek is located along Highway 130 in eastern Richland County by the small village of Bear Valley. The trout portion is about 5 miles long. Noteworthy: A new habitat project area on the upper end provides a good place to fish. The Stretch: Camp Creek flows westerly along Highway 56 in northwest Richland County and enters the Kickapoo River just east of Viola for about 5 miles. Access Point(s): Highway 56, two county highways and town roads. Noteworthy: A campground is present on the lower end along Highway 56. The Stretch: Flows south along County Highway E in western Richland County. The trout portion is about 15 miles long. Anglers fish for big trout below the designated trout portion all the way to the Wisconsin River. Noteworthy: It has a no kill area and a regular fishing area. 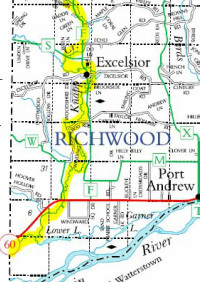 The Stretch: Knapp Creek flows south along the western edge of Richland County and enters the Wisconsin River just north of Boscobel. It has about 13 miles of trout water and is also a stream that has trout below the designated trout portion. Access Point(s): County Highway Q and many town roads provide good access. The Stretch: Willow Creek flows along Highway 58 in eastern Richland County. The main trout fishing area is between the small villages of Ithaca and Loyd. The designated trout portion is about 20 miles long. It too provides a “big trout area” below designated trout water. Access Point(s): Access is excellent via many town roads and Highway 58 as well as two county highways. Noteworthy: It has a no kill area and a regular fishing area with special rules.